Everyone has a guilty pleasure and I'm no exception. In fact, I've got more than a few musical "guilty pleasures;" those songs I really don't expect equal enthusiasm or many high-fives for them...nor do I care (Insert grumpy old man: "Chick tunes! Who let her in the battle of the bands? This is a manly place!"). In 1995, Sussex's own musical imps formed the band, Keane. Much more popular in Great Britian, I believe, but the internet keeps me pumped full of European radio; which I do indulge in. Thank you, Al Gore. Their first album, Hopes and Fears, remains my favorite album from this band and in January 0f 2004, the single "Somewhere Only We Knox" was released as a single. I've always liked this song, especially the chorus, and the video just cracks me up with it's woods' sprites or whatever they are supposed to be. I've got a friend who mocks me by calling this song "Somewhere-Only-We-Know-a-Weird-Alien-is-Watching." Hey, back off...it's Druid rock. They go WAAAAAY back to their ancestral roots. See? There's another root right there...looking at you. Nonetheless, I surprised to find covers of this song! This is one time where the video is almost too interesting. I find myself wanting to draw bunnies... oh, was someone singing? Everything in my being wants to like Glee, but I just can't get into it. I do, however, like the sound of some of their covers. I run into them from time to time when I'm looking for Battle of the Band fodder and make a mental note..."that one might not be too bad..." I'm a sucker for a choral arrangement or harmonies. But this is not about me...oh, no: What do YOU think? Lily Allen or Darren Criss? Can they pull it off without weird woodsy critters? Time to vote! 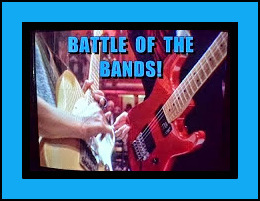 Then, pop over to my pals' blogs n' battles! I vote for Lily Allen because she's an enchantress. Love that ethereal sound that's so perfect for a fantasy. Thanks for introducing me to this beautiful song. Good grief, my text was all wonky! I'm ashamed, Janie, ashamed! I really don't like the Glee covers. I didn't watch the show but I am just not wowed ! Love the animation, anything with badgers is good for me plus the rabbits look like the ones for Waterships Downs. Love the book and movie. Anyways long comment. I will have to vote for Lily. Chero..... I love Keane and thought I was the only person in America who knew them. I add them every so often to the what I am listening to music on my posts. We must be on the same wavelength, because I thought I was the only person who loved Keane, too (but Robin likes them...see below). I always think I should love Glee because I was in a "very-Glee-like" group that also toured. But...meh. LILY ALLEN GETS THE VOTE! Thanks, Gayle! I scroll the video off the screen so I only listen to the music. It was close but I'm going with Lilly. That's my granddaughters name! And isn't that reason enough? LOL. LILY ALLEN! Thanks, Mike! I think you're stats are going up again tonight! I really like this song a lot. The sound takes me back to the Beatles and Badfinger and the likes of those types of bands. The choice between covers is a tough one for me as both versions have merit. The piano and spareness of the version by Lily Allen is very appealing. This version is hauntingly beautiful. The dynamics and great arrangement in the version makes this choice outstanding. I think I'll go for the Lily Allen version as the one that I prefer the most. That's my vote. I was referring to the Glee version in my second description about dynamics and arrangement. Oops! One of my granddaughters is named Lillee which is a variation of Lily but incorporates my name--Lee. Interesting bit o' Lee trivia! Thanks! Lily A gets my vote. I liked her vocals better. LILY ALLEN GETS THE VOTE AGAIN! I LOVE Keane! (you're not alone Parsnip, I'm from USA also) They were one of my faves in college. Great choice for a BOTB. My faith in humanity is restored as closeted Keane lovers emerge. A VOTE FORE LILY ALLEN! I'm going to go with Lily Allen's. Her voice fits the song better. And yes, I was busy watching the animation. You don't see cell animation much anymore. Ha ha ha...I could hardly keep from watching the animation. I found another clip of her singing this song live at Cannes, but I loved the animation. As with many others, I vote for Lily Allen . Love the voice on this one. She is going to sweep this one, I think. LILY ALLEN, IT IS! Thanks, Linda! Cherdo, I didn't know this song until now. I really like it! I'm like you, I really want to like Glee, but I just can't get into them. As a whole, they sound too produced. There's talent in the mix, but not enough to make me want to buy their music or to watch the show. I really like Lily Allen. In fact, I think I like her better than the original artist. Give my vote to, as Janie said, the enchantress Lily! Nicely done! Bingo. We are on the same page with Glee, totally. Not saying this is a bad version, I never post ANY version I don't like. Cathy votes for LILY ALLEN! I'll take it! Thanks, Cathy. I'm going with Lily also. A fine performance by all. The pOpTaRt has spoken, and not evilly! LILY ALLEN! Thanks, epT! I liked Lily Allen when I was listening to it and thought I'd be voting for her but then I listened to Darren Chris and I really like his version. So he gets my vote. Thanks for introducing me to Keane! I like their sound. Finally, DARREN CRISS gets a vote! Thanks, Michele! Lily Allen gets my vote. Yes! A vote from Stephen: LILY ALLEN! Part of me really wanted to vote for Glee just to give them a boost in this very lopsided vote, but I'm afraid my ears weren't so inclined. Lily really does a fabulous job with this song. I might like it more than the original. Well, I don't know if I'd go that far, but it's darn close. With repeated listening I might like it more than the original... that's possible. So, she definitively gets my vote here. Sorry Glee. You aren't hanging around with enough old geezers, Robin (that was a hidden message for "those that give me grief over such things." And I know I don't know what I don't know, you know? It's basically everything. That makes me like you so much more; I cry when I hear certain songs, too. I like the clarity of Lily Allen's voice. Am giving my vote to her. Not a bad battle (for a chick song) just kidding! I enjoyed this battle! It almost sounds fragile, ya know what I mean? And every time I hear a song like that, those-who-cannot-be-named refer to it as a chick song, lol. Thanks for the vote, Mary: LILY ALLEN, it is! I thought that, too...she was all over the place, Even the video I posted was a relative oldie. Thanks, Debbie! A VOTE FOR LILY! It's so nice to see you...or should I say, read you:) I love the Lily Allen version because it is so other worldly to me. Glee has strong voices but it didn't move me as much as the first one. I have to admit, I watched the video after and I don't know what is with me but I started crying....silly me. That's what makes it a chick video, my male co-horts tell me, ha ha. I love that video. But Lily is running away with it. A VOTE FOR LILY! Thanks, Birgit! I thought at first I had to choose between Keane and LA, which would have been tough-but I am not a fan of Glee, so this one was easy-Lily Allen all the way. I'm getting the vibe from all the comments that I am not alone in my distaste for Glee...yet it was hugely popular! Thanks, Larry! ANOTHER VOTE FOR LILY ALLEN! Second, I think I have to turn in my man card if I vore for the Glee guy. But... I liked his better. Not close to the original, but pretty good. DARREN CRISS GETS THE VOTE. And brother, he needed it. Lily Allen is kicking his bootie. So that's called Druid rock? Ah, that song brings back memories. I prefer the original overall (nostalgia and all that), but Lily Allen kills it. I can't stand Glee, and that pretty boy boy-band sound is like nails on a chalkboard to me. One vote for Lily Allen, por favor! Again, I WANT to like Glee...but I can't. For you guys, anything. Your wish is my command: LILY ALLEN GETS THE VOTE! >>... "Who let her in the battle of the bands? This is a manly place!" That's right! And if I drank just 12 beers less per day than I do, even I couldn't get into this gig! And you will not be pawed at, thank you very much. I liked that video for the original group... up until the aliens appeared. What's up (with that), DOC? They had a good thing going there until they invited the outsiders in. Is that our "Laughing Place"? Or maybe Tombstone, Airheadzona? Bingo on "Somewhere Only We Know," Dandy! It's the ha-ha zone. I'm late with totals...excuse moi! A VOTE FOR LILY ALLEN! It's interesting to listen to a different genre of music. It's not for me either (I see the root) but it's pretty amazing stuff! It's a tough choice but I vote for Darren Criss. I'm wishing you a rad rest of the day Cheryl! Thanks for stopping by, Maurice! I've missed you and I'll be around to check out the fantastic artwork this week. A VOTE FOR DARREN CRISS!